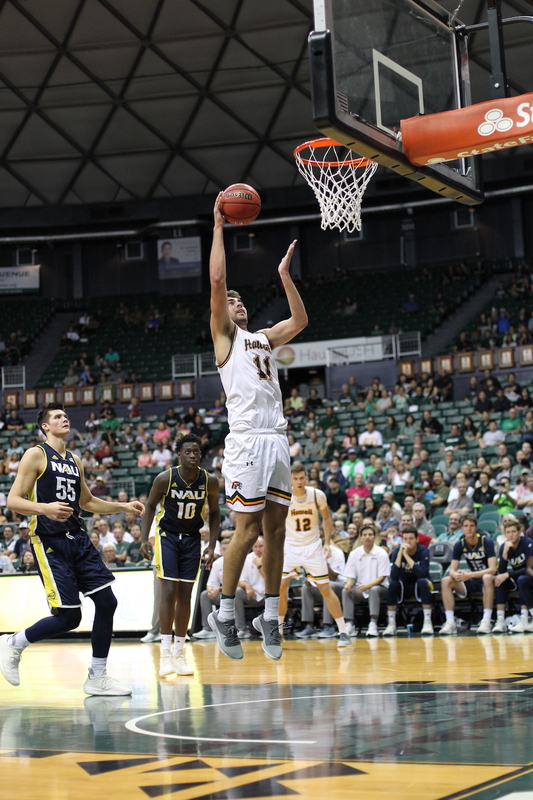 Eddie Stansberry scored a game-high 19 points — including five 3-pointers — and Zigmars Raimo added 17 points tonight to help Hawai’i blow past visiting Northern Arizona, 85-68, in non-conference men’s basketball action. A sparse-but-vocal crowd of about 2,600 watched Jack Purchase add 11 points and Brocke Stepteau chip in 10 points as the Warriors improved to 3-1 heading into the John Wooden Legacy Classic in Fullerton, Calif., Thanksgiving Weekend. Northern Arizona hung tough for most of the first half, using a 9-0 run capped by Cameron Shelton’s free throw you close it to 23-22 with 7:39 remaining in the first half. But UH responded with an 18-3 run to close out the half and the Lumberjacks could not get closer than nine points the rest of the way. The Warriors are scheduled to depart for California this week to participate in the Wooden Legacy tournament at Fullerton. Hawai’i will face Utah on Thursday in the first round of the three-day tournament.